KILLINGTON — Hope Davis from Forerunner Ski Shop presents Vermont Adaptive Senior Program Coordinator Tom Alcorn five new OSEBE Helmets for program use at Pico Mountain. The Forerunner Ski Shop for many years has supported the organization by tuning skis and assisting in repair of the organization’s adaptive equipment. 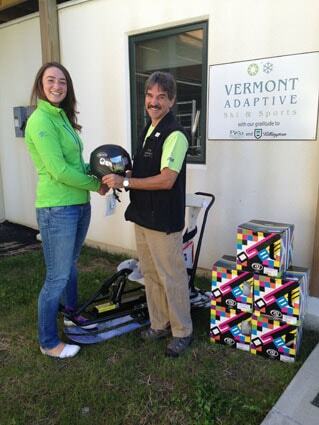 “Vermont Adaptive participants will be thrilled to have these new helmets in the equipment fleet!” said Kim Jackson, director of outreach and communications for Vermont Adaptive Ski & Sports.